With a strong foundation in biomedical engineering, Dr. Wang employs an innovative approach to solving clinical problems. His surgical philosophy centers on cutting-edge adaptability, utilizing developed and novel technologies including robotics, instrumentation, and biomaterials in his practice. This allows his armamentarium to expand and adapt to an ever widening range of surgical problems and patient needs. His fellowship training in advanced laparoendoscopic surgery focused on micro-invasive instrumentation, creating skin incisions so small they do not even need to be stitched closed, and on advanced endoscopic techniques that can obviate the need for surgery in certain situations. 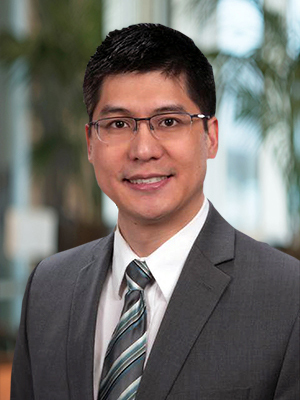 Before starting practice with North Dallas Surgical Specialists, Dr. Wang grew up on the east coast. He attended high school in Philadelphia, college in Baltimore, and graduate school in Durham. But after he met his wife at the University of Texas Southwestern Medical School at Dallas, he knew his heart would stay in Texas. After completing surgical residency with the State University of New York at Buffalo, he returned to Texas for a minimally invasive surgical fellowship with the University of Texas Health Sciences Center at Houston. “I am very blessed for the privilege to treat my patients, and the price for that privilege is commitment and compassion," Dr. Wang reflects. It is this philosophy that drives him to go that extra length to ensure his patients’ needs are addressed. When not in the operating room or in the office, Dr. Wang enjoys playing tennis, snowboarding, volunteering with church, and trying out new recipes to cook for his family.